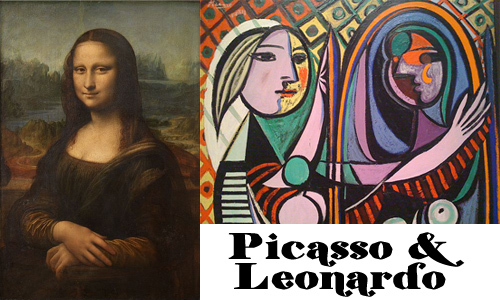 Very interesting article about Picasso and Leonardo. Thanks for this! Most people associate Picasso only with his abstract paintings. It was refreshing to see the reference to his sculpture and ceramics! What is truely interesting about Picasso is that during his early years he was a traditional realist. At age fourteen he produced First Communion and a very sensitive Self-Portrait at age fifteen. The next year he produced a very nice pencil drawing of Matador Luis Miguel Dominguin. Picasso’s journey into cubism was yet another way to express through shape and form. I personally grew to like Picasso only after a heavy dose of Art History. After that immersion,I have been fortuneate to see a lot of his work, including Guernica at the Sophia in Madrid. Powerful stuff! Nice site! I saw the link on your comment from http://pavlovshairconditioner.wordpress.com/ and couldn’t resist. I never knew that da Vinci painted fewer than 30 total paintings. That’s really amazing! You probably know the book The Story of Art (E.H. Gombrich), which I find quite interesting. Keep up the fascinating blogging. To achieve the realism of “Mona Lisa” probably took a hundred times longer than to paint one of Picasso’s cubist paintings. Great article! Thank you for the link and for dropping by. Fascinating to think about, especially in regard to both artists being a product of their culture. In light of that, I wonder at the type of work that Picasso or Da Vinci would have produced in a different cultural environment? Would it have remained the same? What if they had been contemporaries of one another? hehe, questions are great catalysts for discovery. Thanks again! What an interesting angle for an article. Very fascinating. Thank you for sharing! Love that Picasso. Keep ’em coming! I want to share a blog with you from Sandy. I hope you enjoy! http://theoldsilly.com/2011/04/10/creative-thinking-with-sandy-sims-on-virtual-tour/. Thanks from Segmation dot com. a very astute observation. Bravo.